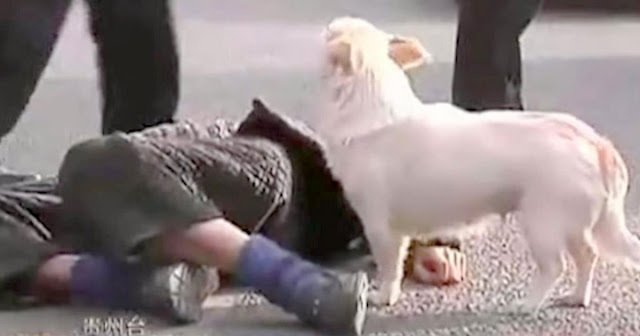 A little white puppy’s owner refused to leave his owner’s side, even when the owner had passed out and fainted in the middle of a busy street. The puppy seemed helpless and a bit distraught, but even when others tried to offer help, the puppy was there every step of the way. The dog defended his owner and shielded him with all his might. He barked and snapped when police tried to get closer, and the medical team even had trouble getting the man into a waiting ambulance. Even when they finally got to the passed out owner, the little white dog paced back and forth, keeping watch over the first responders. After seeing how loyal this dog was, the team agreed to allow the puppy ride along side his owner in the ambulance.